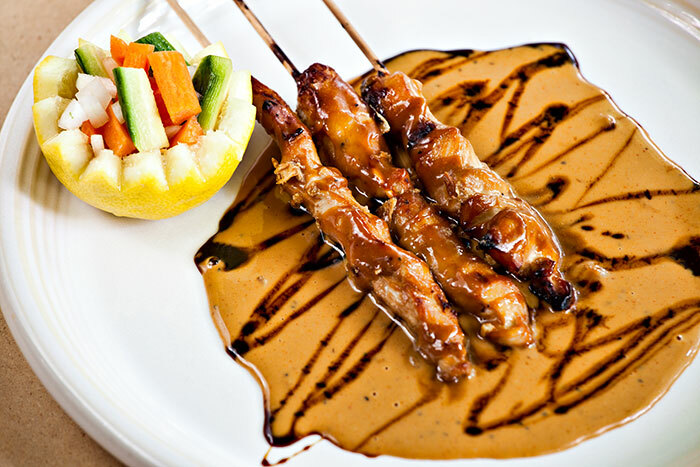 Chicken skewered and grilled to perfection served with a peanut and sweet soy sauce. It’s what was for dinner tonight. There is no setup shot tonight because this one was shot entirely with natural light. I simply placed the plate of food near a window and used a 46″ silver reflector to bounce more light back onto the plate. No flashes, no light setup just simple natural sunlight. I used a Canon 5DII and a Canon 70-200 f/4 lens set at 200mm and an aperture of f/8. I set the camera on aperture priority which simply means I set the aperture to what I want and the camera sets an appropriate shutter speed based on what it sees as the correct exposure. In this case it set it to 1/5 second which meant I needed to use a tripod. In order to minimize camera shake I also used a wireless remote trigger. If you have any questions about this shot or setup I’d be happy to answer them. Looking forward to hearing from you.